Ideas for Elite Design Baby Shower Mini Glass Bottles . The clock is ticking toward the arrival of your newest family member. 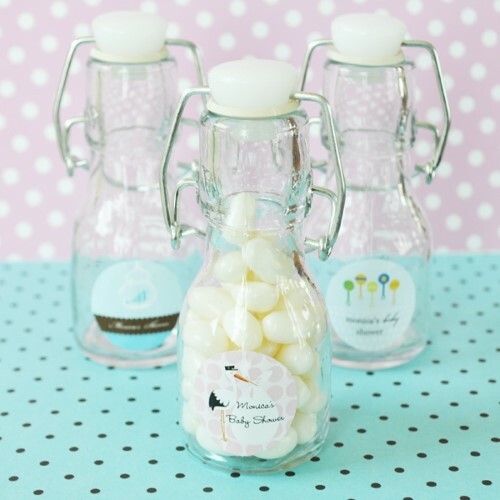 Spread the news of this joyous occasion with our Elite Design Baby Shower Mini Glass Bottles. Fashion these adorable bottles into "message in a bottle" favors by adding a personal thank you message or poem inside or fill them with your favorite goodies like mints, jelly beans, bubble gum and much more. You can even color coordinate between pink and blue candies to match your baby girl or boy color scheme. Not only can you fill these bottles with goodies of your choice, but we furthermore customize your order with personalized labels! You can choose from our limitless color combinations and designs to make the perfect label for your shower. From delivering storks to the pregnant happy couple, we have just the design for you! Your guests can refill these adorable jars with their much loved treats as many times as they wish and will remember this special day with every yummy bite!